Dr. Wells and his team were early adopters of the Invisalign Braces. Replacing traditional metal braces with a less invasive and more attractive straightening option has been a huge success with his clients. 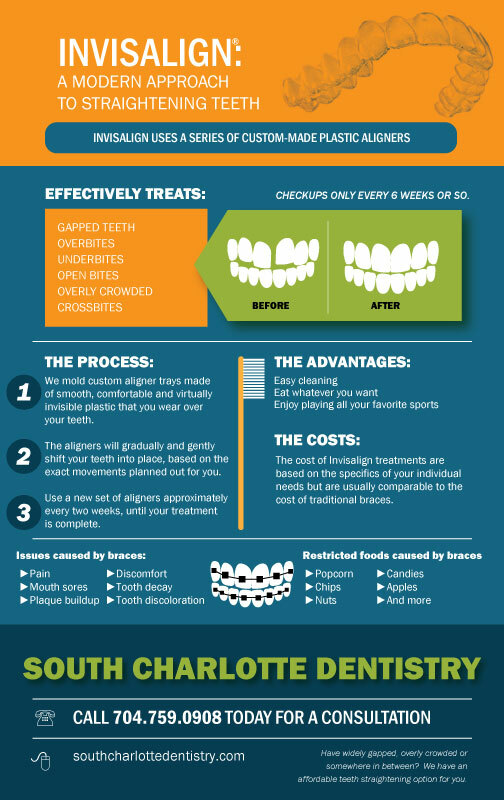 Invisalign is a tooth straightening solution for both adults and teens. It takes a modern approach to straightening teeth using a custom made series of aligners designed for each individual patient. These aligner trays are made of smooth, comfortable and virtually invisible plastic that you wear over your teeth. Wearing these aligners will gradually and gently shift your teeth into place, based on the exact movements we plan out for you. There are no metal brackets to attach and no wires to tighten, adding to your comfort. Every two weeks you change out to a new aligner until your treatment is complete. These best part about the process is that most people won’t even you are straightening your teeth. Gapped Teeth – Several things can lead to gaps between teeth. Abnormal jaw growth and missing teeth are the primary causes. Outside of cosmetic reasons, it’s important to attend to these gaps because spacing issues can lead to gum problems, periodontal pockets and an increased risk of periodontal disease. Overbite – An overbite occurs when the upper teeth bite over the lower teeth. Again, there are cosmetic reasons to correct this, but more importantly, an overbite can cause undue wear on the lower teeth. It can also lead to gum disease and painful jaw and joint problems. Underbite – This is when the lower teeth protrude past the upper teeth and is usually caused by the upper jaw not growing properly. It can also be caused by missing teeth. This misalignment may cause the upper teeth to wear out faster. An untreated underbite will eventually cause painful jaw and joint problems. Open Bite – Although not as common, an open bite is when teeth (both upper and lower) are unable to make contact. This is most often caused by genetic abnormal jaw structure or excessive thumb-sucking. An open bit will cause poor and painful chewing and in some cases a speech impediment. Overly Crowded – This occurs when there is simply a lack of room within a jaw for all teeth to fit normally. An overcrowded mouth will result in the teeth pushing each other around and result in even more crooked teeth. A crowded mouth will also encourage plaque buildup, tooth decay and an increased chance of gum disease. Crossbite – This is when the upper and lower laws are both misaligned. A crossbite will cause one or more of the upper teeth to bite on the inside of the lower teeth causing unnecessary wear and tear, gum disease and bone loss.